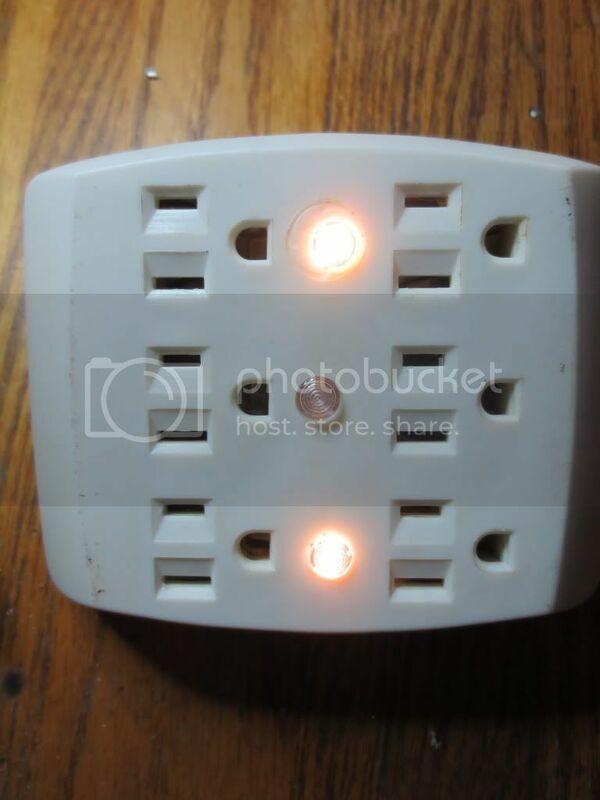 Here is another power failure outlet box using two white LED's. on each end of the PC board. I used a smaller 10mm toroid coil, but it still required standing up to fit. and they should last long enough for most blackouts. At 750 ma hours, drawing 32 ma, it should last 20 hours easily. The battery holder is an A23 holder cut in half to make it longer. AAA batteries are the same diameter. already cut one out so I used some insulation putty to help retain the proper length. accommodate the new circuit wiring. It had that ugly orange night light circuit I messed with before. 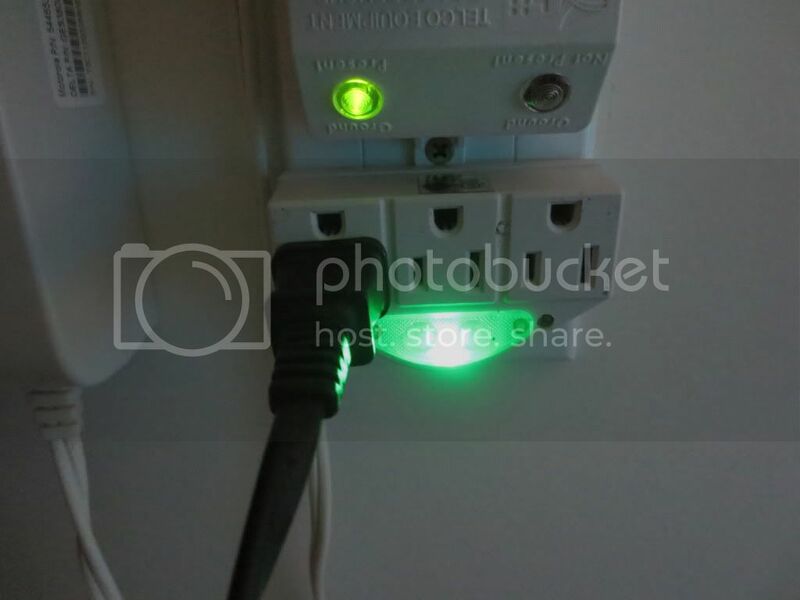 The green LED run off of the AC trickle voltage is between the 2 white ones to indicate everything is OK.
battery if it ever dies for some reason. The trickle charger should not harm them at 6ma tops. 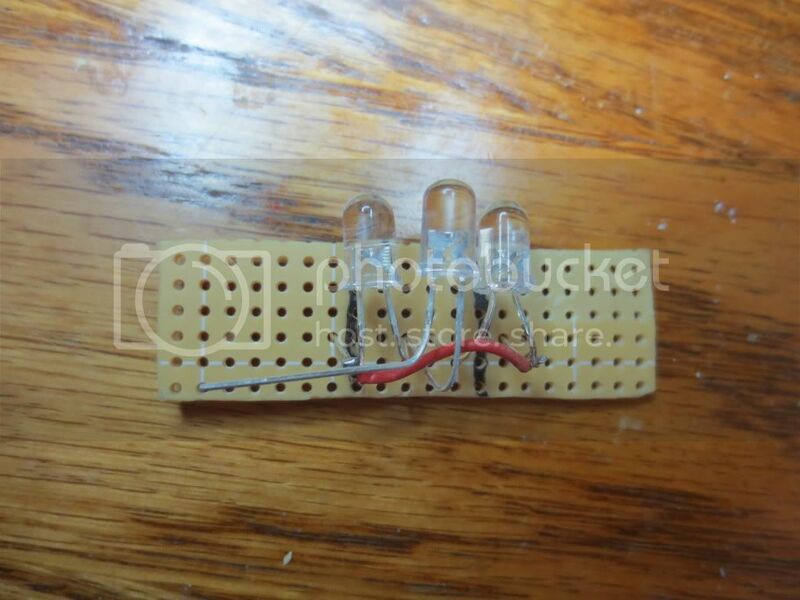 I am going to start work on an LED tester by testing the orange LED and making sure it doesn't blow up. Last edited by burger2227 on Mon Apr 29, 2013 9:21 am, edited 2 times in total. It is pathetically not bright either, but it killed the green power LED on the tester while it was connected. less voltage. 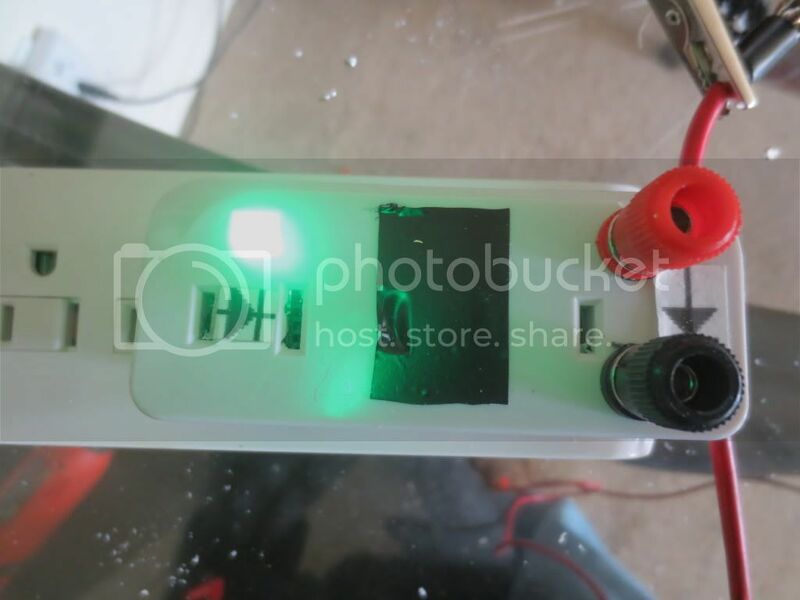 The green LED is a bright one rated at 3 volts. the AC used to be to test and compare brightness of a few LED's at once. ACfreq = 60 ' 50 'in Europe and Asia? Note that the calculation uses 60 Hz for American electric supplies. Europe and Asia use 50. The capacitor value can be entered in Farad decimal point values or Micro Farads greater than .001. I added a resettable fuse rated at 1.35 amps and a MOV both rated at 30 volts. 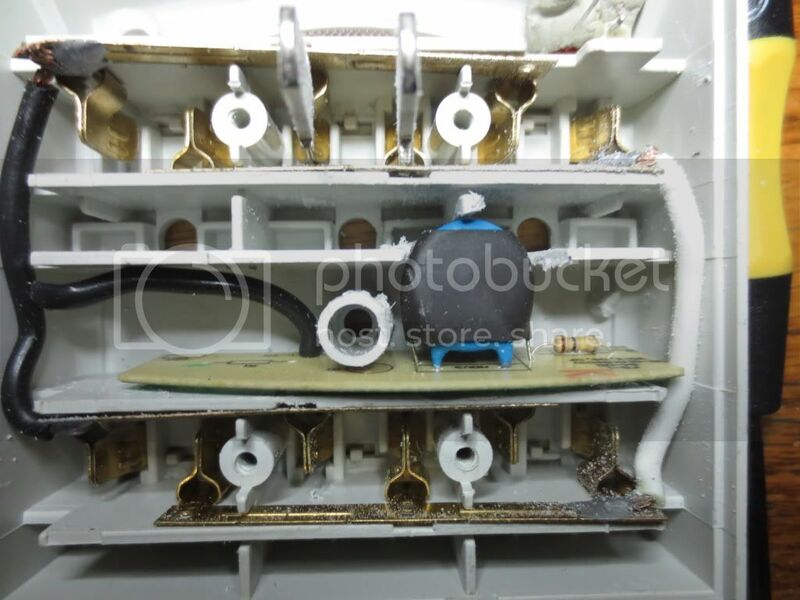 The narrower slot (top bus pictured below) should be the bus that the capacitor is soldered to. 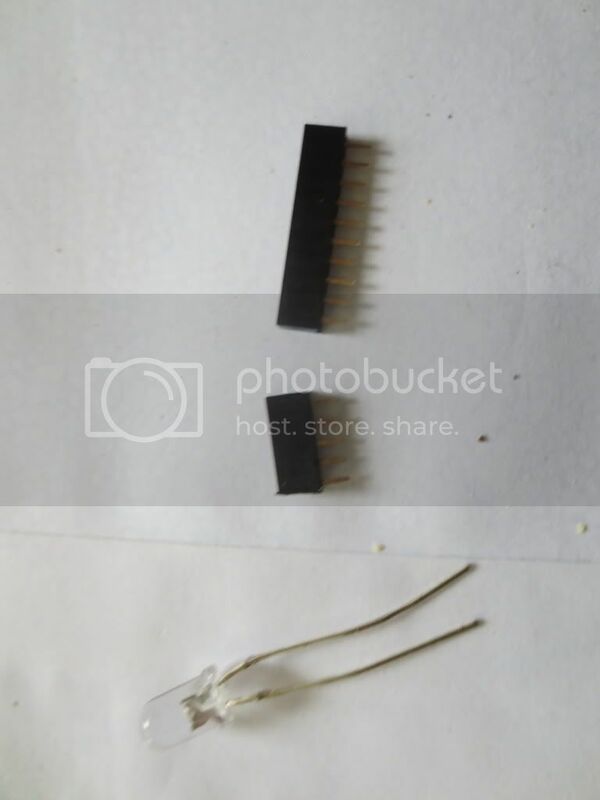 To prevent reverse polarity problems connect the 1K resistor to the ground prong instead of the common bus! If the tester does not have a proper ground it will not work. Safety first when working with high vltages! I also added BNC connectors for testing LED's in circuit or for volt meter readings when needed. 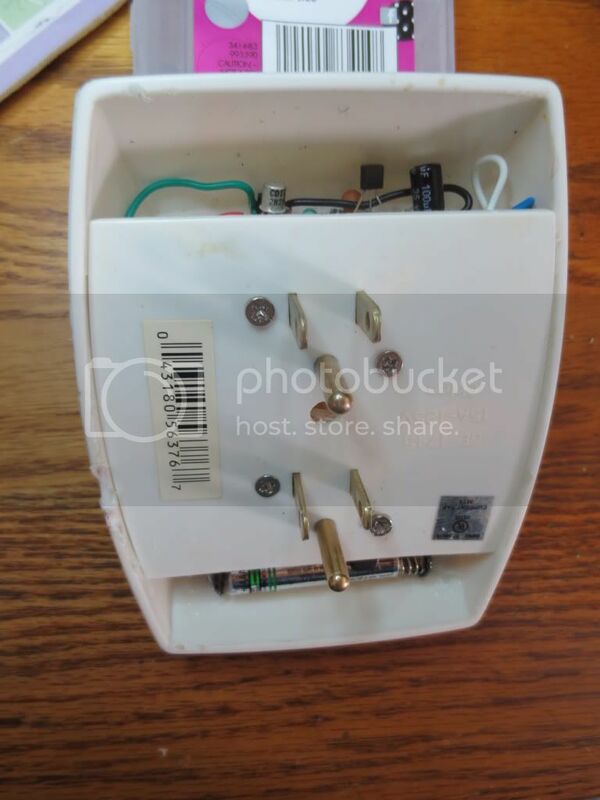 to drain any left over voltage when disconnected. Also, do not remove the round ground prong! It keeps the high voltage line in the right place on the capacitor! That way the high voltage is best isolated from the user. 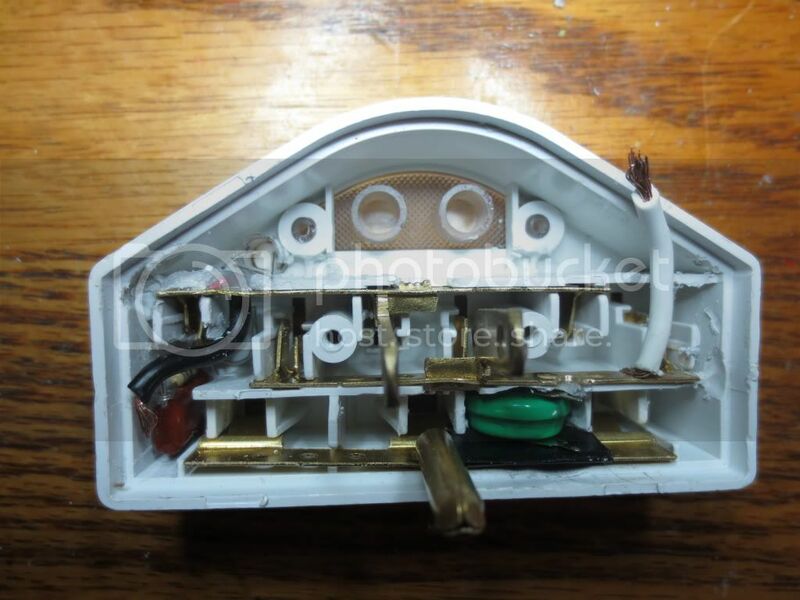 Again, don't plug the circuit in with the back off of it! I taped over that center outlet too. I kept enough of the line buses to keep them stable or they might wobble too much. 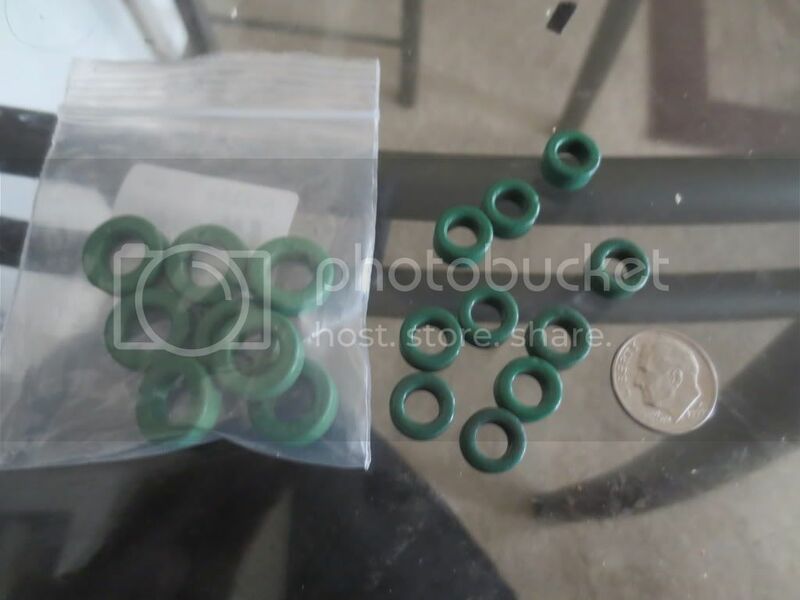 The 5mm green LED slid right into the ground hole and rows of female pin header connector strips fit tightly in each prong slot. After I cut the strips to fit each slot. I soldered a resistor wire to every connector so the pins would not fall out. They will all be the same polarity anyhow. One slot took 4 and the other took 5 to fit tightly. 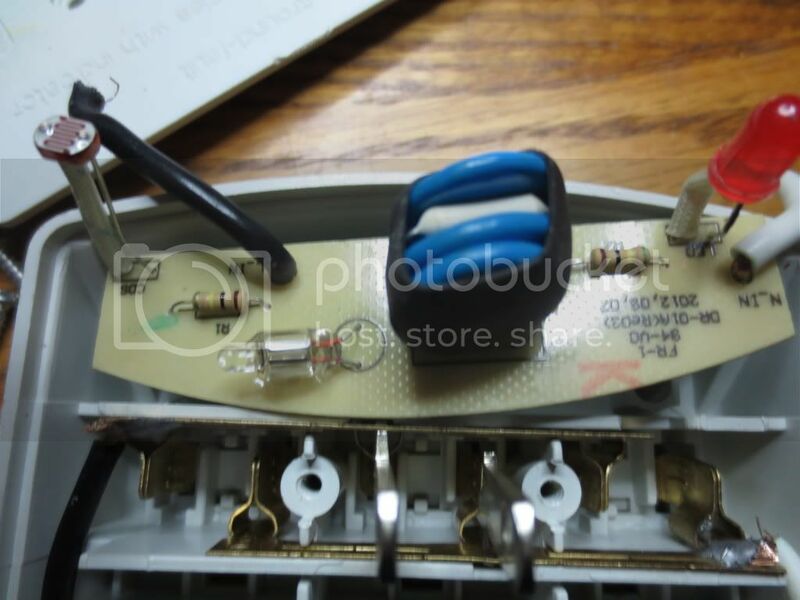 LED is less than 2 volts. 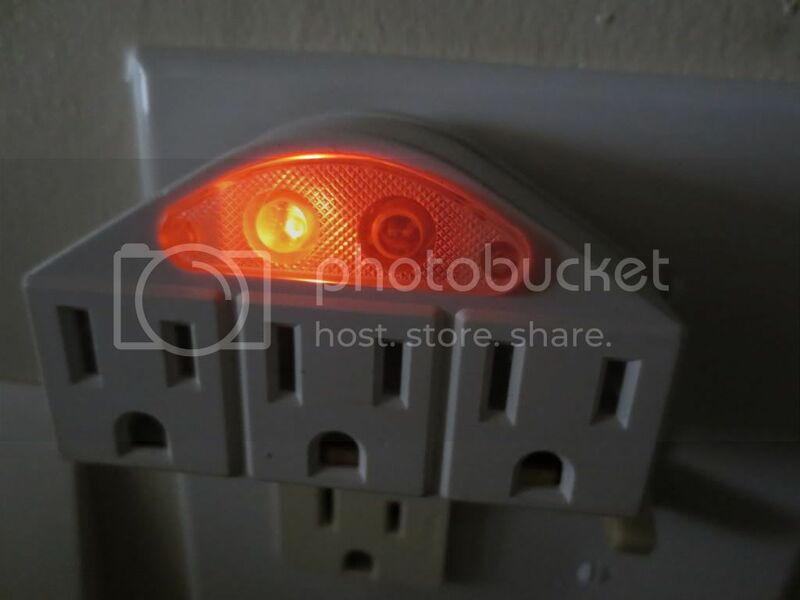 Use a bright 3 volt or higher LED for the power indicator or other LED's may not light! The biggest headache was the BNC connectors as the back of the box is tapered in. Took a lot of effort to fit. Last edited by burger2227 on Sat Jun 15, 2013 10:12 pm, edited 1 time in total. This adapter does not require the wires to be stripped at all. Just spread the wires apart and rout in channel. 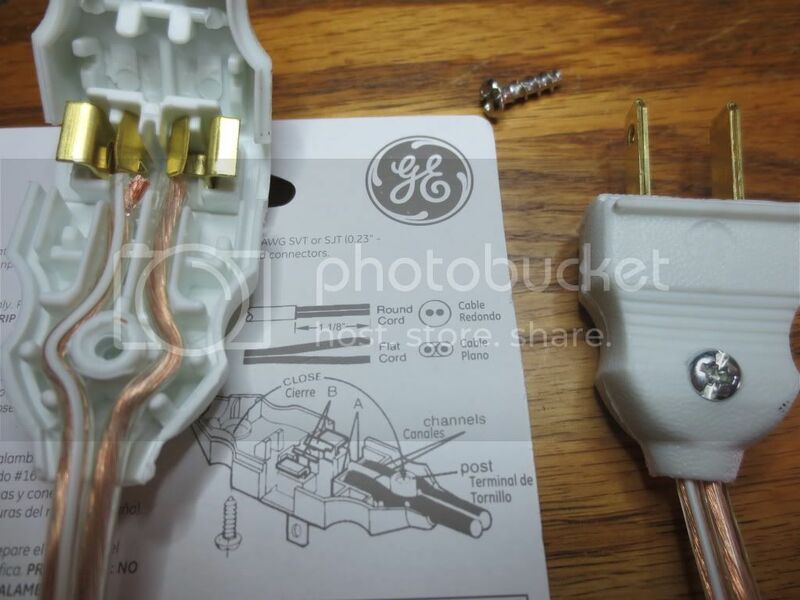 Use the screw to pull the sides together and complete the connections. 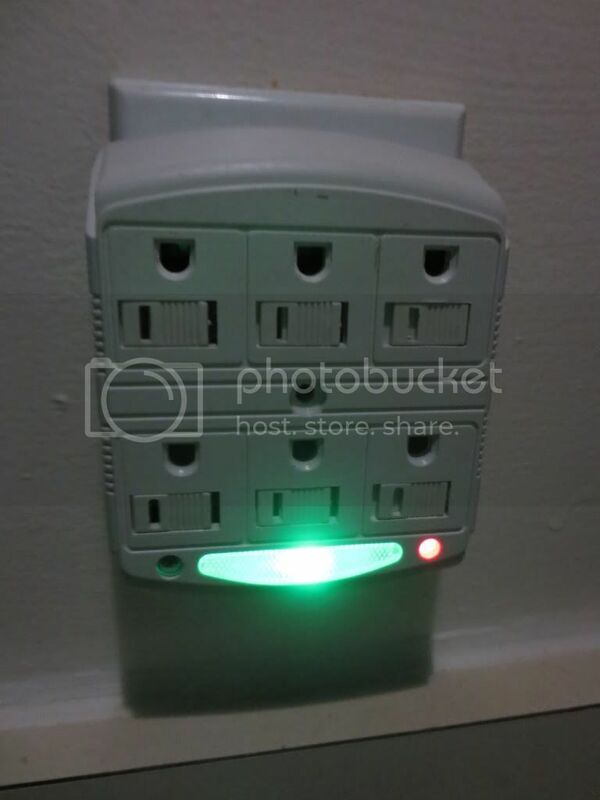 Slots could be cut into a project box if the box is to be plugged directly into the wall. This box will be made into a flashlight that only comes on if the AC power is lost or it is unplugged. It will not require a switch and will stay charged up until needed using the AC power failure circuit. 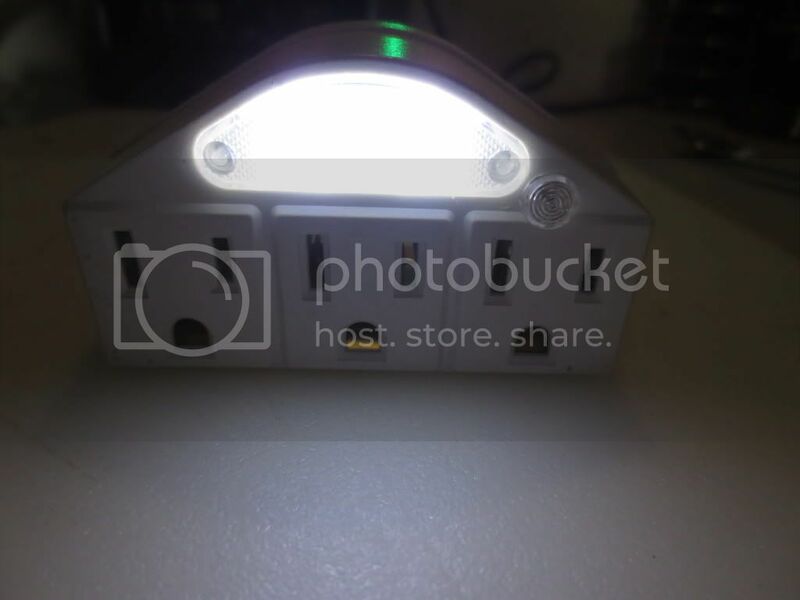 It will also have a test button and a power indicating night light. Once the wires have been crimped, the adapter can be cut down to fit inside of the box. Keep the box retaining the wiring together while trimming it to fit in a project box. If it has to be cut down below the screw, use good tape or glue to hold it together. (The Light Dependent Resistor required about 33K to ground instead of 100K and no 100 pf capacitor). Instead of using the LDR, I sent the AC trickle voltage directly to the lower transistor with varying resistances. as a switch to cut off power to the LED driver just like the other flyback driver. The nice thing about this circuit is that you can use coils without having to wind them or find forms. Convert .470 mh to 470 uh. The BC338 transistor can also be used, but it draws more current. The 2N2907 or 2N5401 shutoff transistor requires a 100 uf capacitor on the rectified AC base trickle voltage. The PNP transistor replaces the bottom transistor used to shutoff the solar light oscillator by grounding it's base. The PNP transistor cuts off all current when voltage is on the base so this circuit can use regular batteries too. If non-rechargeable batteries are used, do not try to trickle charge them as they may overheat! 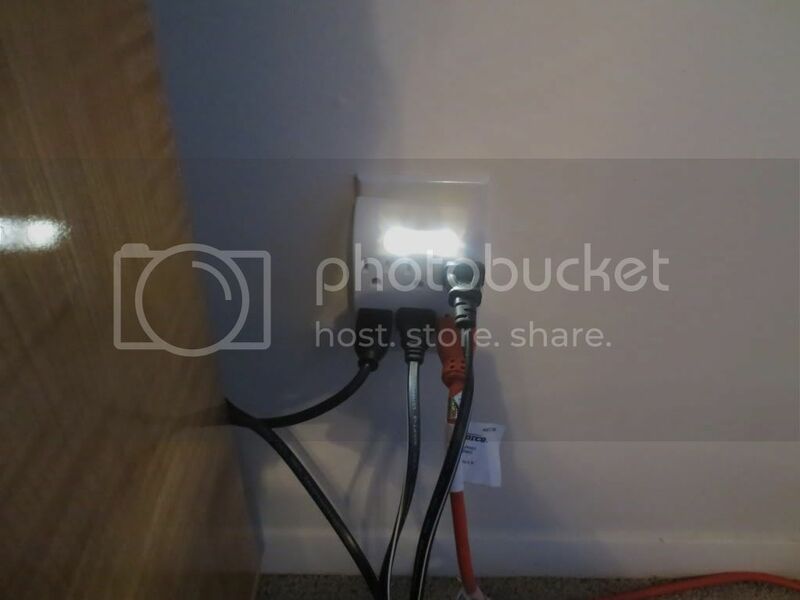 This outlet box had a partial back so the circuit is visible. All of the high voltage is wired in the center with the LED's. The red wire comes from the plus battery, green is the trickle current, blue is plus to LED's and white is common. 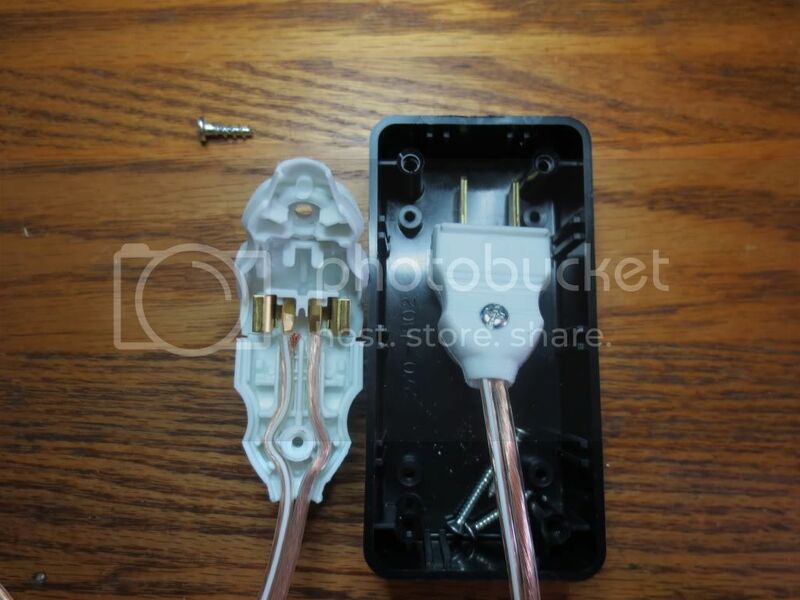 Using solid wires holds the circuit in place so it does not move around in the box and cannot fall out. This was an older box I had already used for a while. The AAA rechargeable battery is in the bottom open area for easy access. 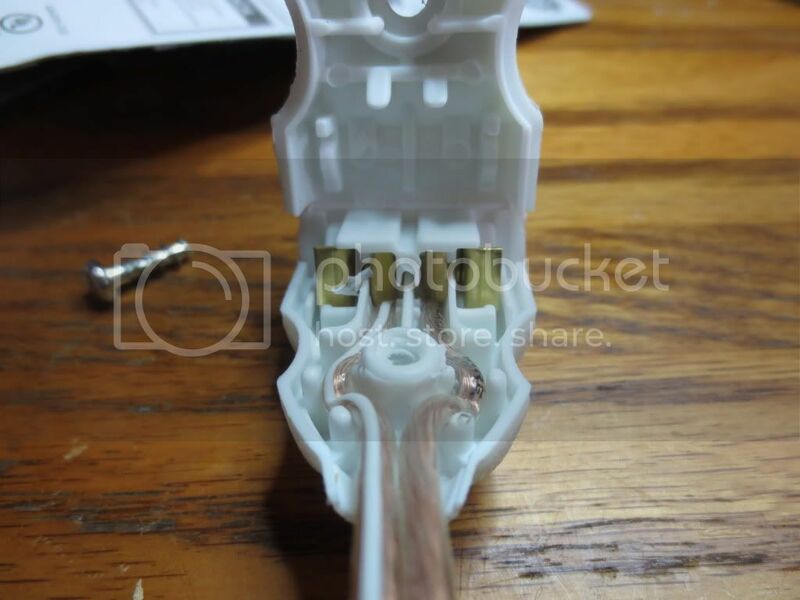 The battery holder is held permanently in place with clear silicone calking on each end. It takes a few hours to solidify. 330 ohm resistor in the box center. a 1 mega ohm resistor to discharge it when the unit is unplugged and prevent getting shocked. Once the back plate is replaced, it should never have to be removed again. Make sure that the back cannot come off when the box is unplugged! The circuit board does not take much space so it could also be used for an emergency flash light too. 2N5401 transistors are cheaper PNP transistors than the 2N2907 at 50 cents apiece. 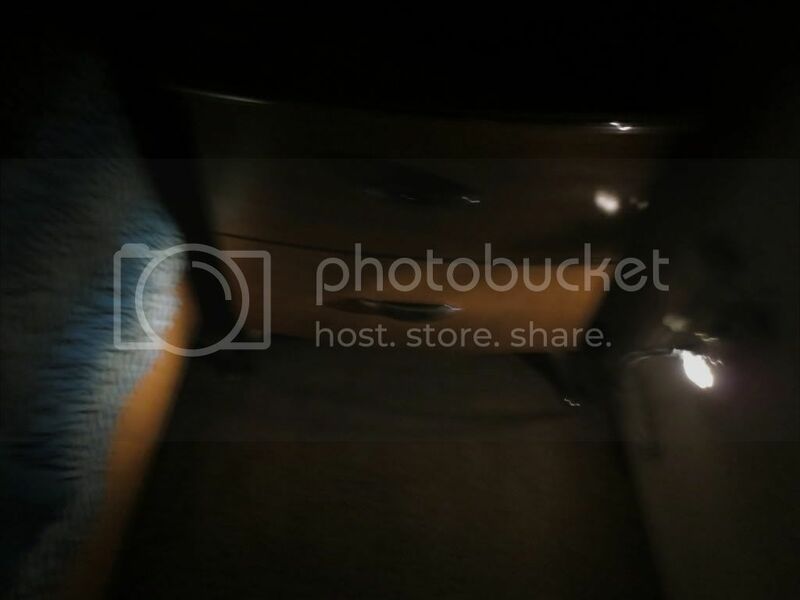 Last edited by burger2227 on Tue Jun 18, 2013 3:08 am, edited 5 times in total. The trickle voltage to the cutoff transistor requires a larger capacitor than what I had used. A 10 uf capacitor is large enough. Larger capacities will delay the triggering of the light. the indicator LED is not desired. Otherwise the white LED driver will stay lit. This circuit will use more battery current than one using a PNP transistor to shut off the supply voltage. transistors are a lot cheaper than the 2N2907 PNP ones. Thanks to Richard Cappels for all of his assistance on these projects. Last edited by burger2227 on Mon Jun 10, 2013 8:01 pm, edited 2 times in total. Woo! Awesome stuff! Fellow EE here. Looks like a nifty weekend project. i'll try it out sometime. Looks like i've missed a lot. i've been gone too long. Good to see you SeaBiscuit$! Where's your horse? 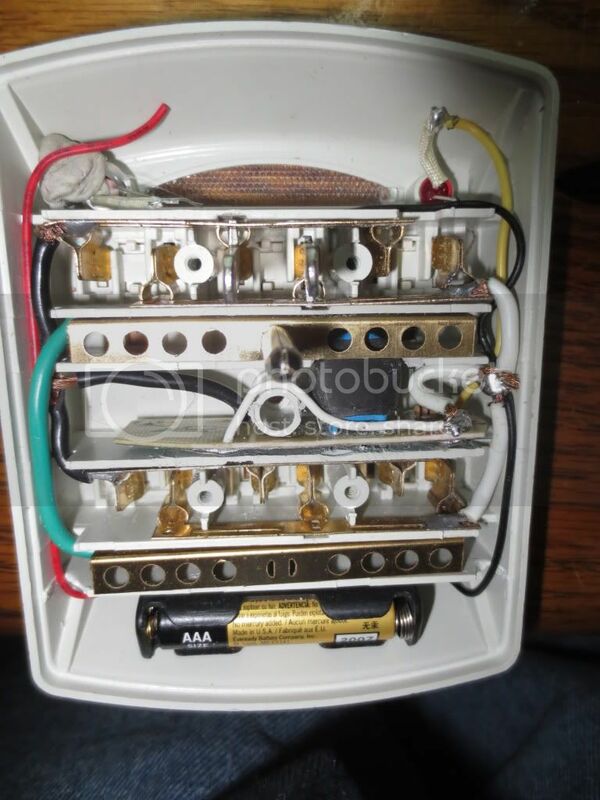 After slotting out the box area in the lower corner, I was able to insert a .068 uf, 200 volt Mylar capacitor into it. After I soldered everything together, I slid it into place. It took a bit of effort to align everything right. I pulled the insulation off of the heavy duty common wire to thin it down and added a fiberglass insulator. The ground bus is held in place with clear silicone calking as it kept falling out. button battery. The LED driver circuit only uses about 12 ma, so it should last for about an hour if the power fails. It will also serve as an LED night light that will be a lot brighter than the old light, though it will stay on. The trickle charge rate would require just a .01 uf, 200 volt capacitor on 120 volts AC. green LED or turn the PNP power failure transistor off. A 200 K resistor on the trickle charge voltage will limit the charging current to the battery to .45 milliamps. could not be used as it draws more than 30 ma with 1 or 2 LED's. the green wire to that LED from above and have the 2 diodes go directly down to the board and battery from there. Tests of the circuit show a 1 ma current draw when it is daylight and 10 ma when the LED's come on. 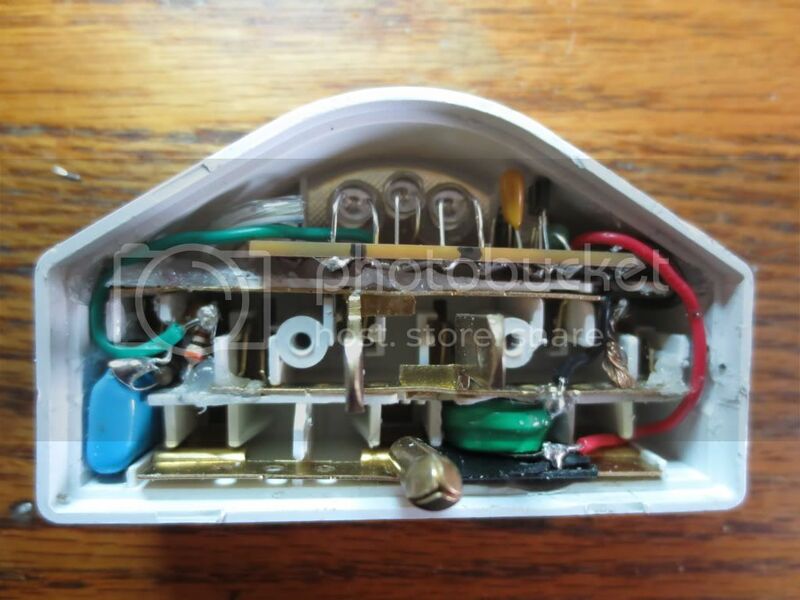 The 2N5401 or 2N2907 PNP transistor completely cuts off battery power when there is not a power failure. It is sensitive to any light source including the LED's so the LDR needs to be mounted away from the clear lens! It will require its own mounting hole in the front to access the room light. I had to grind out one of the plastic brackets the hold the ground bus in place and make a hole up to the next level for a wire. The ground bracket will still slide onto place underneath it and be securely held in place by the back cover when re-assembled. The V15H battery holder is actually a holder for a slightly larger CR1220 battery so I had to bend the outside bracket in a little. the common AC bus above it. 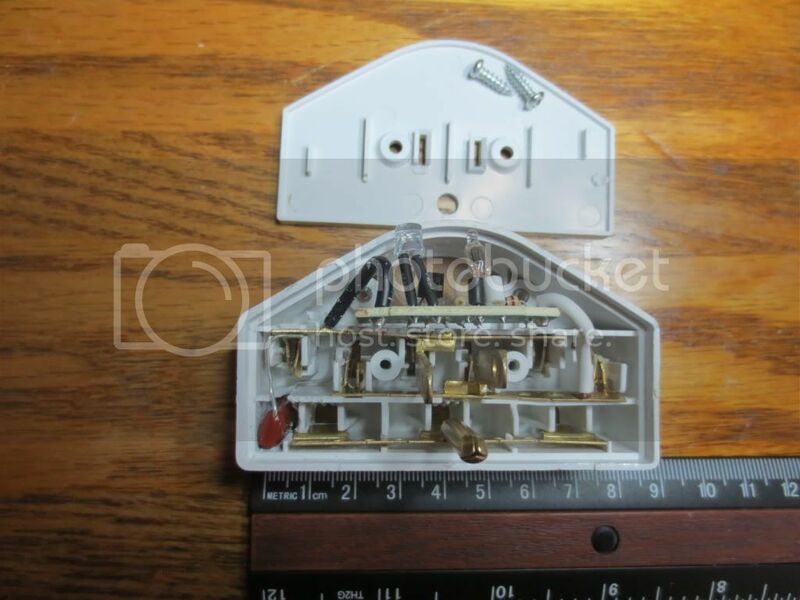 The bottom tab of the holder shown above is the negative battery lug. charging wire. 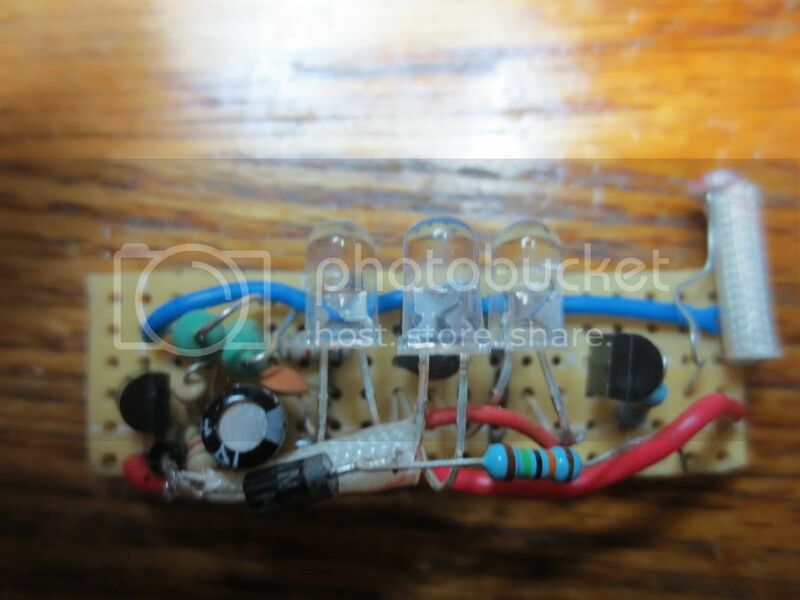 This LED rectifies the reverse AC current and is vital to the operation of the power failure switch transistor. The green wire can later be soldered to the middle LED leg and to a diode going to the board for the PNP switch transistor base voltage. I will also wire the diode and 150K resistor to the red wire above the circuit board for trickle charging the battery. Saves space on the board. The final board has the PNP switch transistor on the left, LED transistor under the middle LED and darkness switch transistor on the right. The red wire going across is the battery voltage to the PNP emitter. 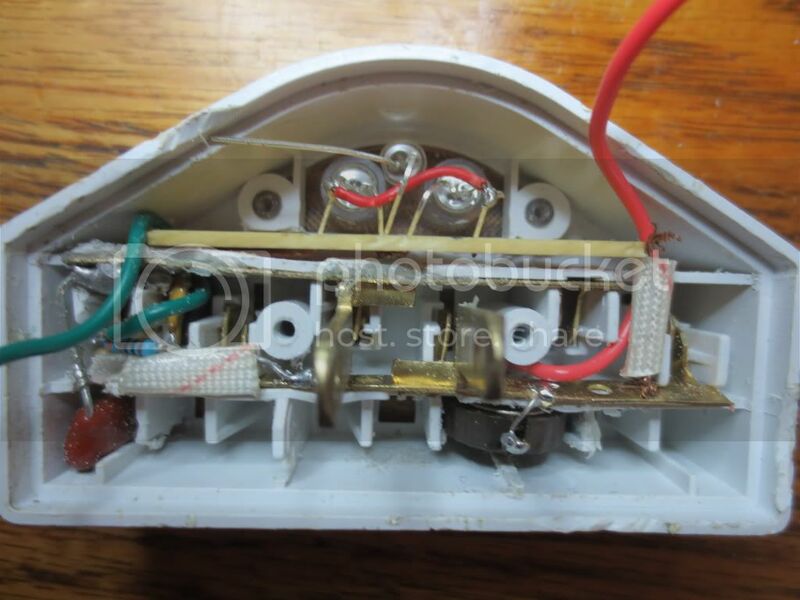 The blue wire supplies voltage to the photocell when necessary. with a single AA battery beforehand as the button battery is not charged up high enough to run it on its own. It will need charged. 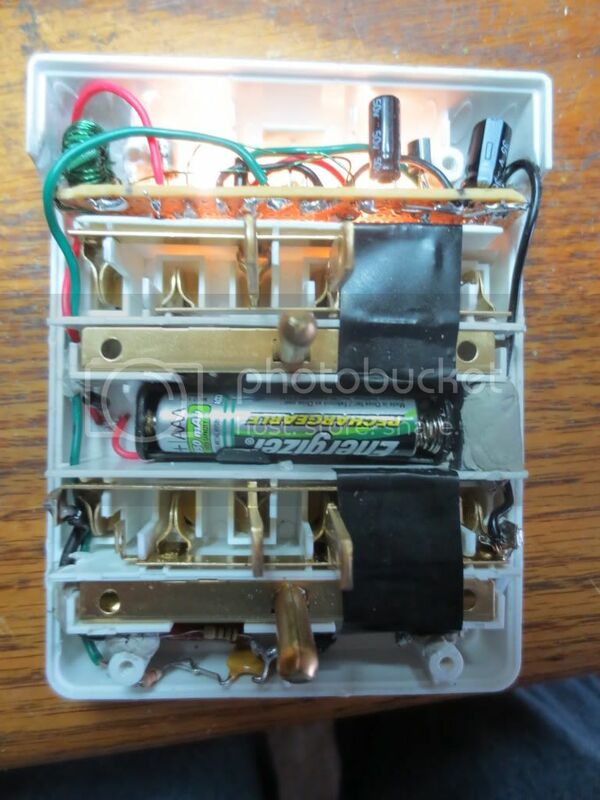 The trickle voltage from the green wire will go to the left of the battery diode. The red battery wire will go to the right of the 150K resistor. The hardest part of assembly is lining up the photocell(LDR) in the front hole on the right side while sliding it into place. Again, the 100 uf capacitor can be changed to 10 uf if space is limited and the PNP transistor will still work OK.
serves as a low power LED night light because I used a bright LED for the power indicator. 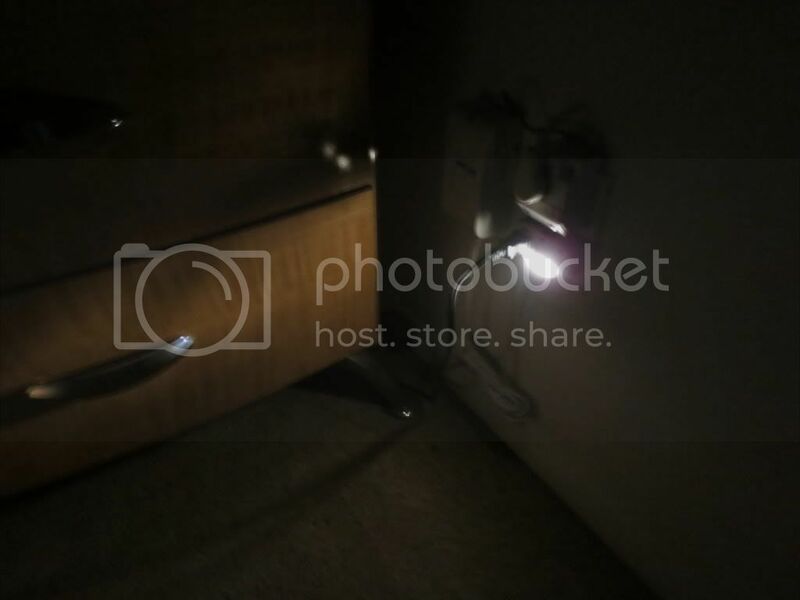 The small hole for the LDR (photocell) can be seen on the right of the LED lens as the wall outlet is wired upside down. I really needed some extra outlets there as Verizon hogged the other one with permanent equipment I cannot move or remove. UPDATE: Not sure how good those V15H batteries are that I received. Best run time is only 20 minutes. I also decided to cut the 150K trickle charger resistance in half because it took forever to charge it up for 5 minutes, let alone 20. I may have to go up to a V40H (40mah) battery as it is the only other kind with that same diameter. It is a bit thicker, but that should not matter. There is plenty of height room for that. that is great, i was hoping i hadn't totally missed this thread as I have been away a while. good to see you kept pushing toward the goal TED. I don't get much leisure time but when i do I come here to check in. the battery your using the 40mah I don't recall common cells having such low mah ratings. I think I would still use a 800 or 100 mah if possible or paralell enough to reach that. as it will require maybe a week to charge but still once it had a charge would last longer. "emergency light"-we loose power maybe once a month with a random storm and power outages last on average about 2-4 hrs before crews get it going again but on extreme cases could take as long 4 days "normally". though a low mah rating will charge quicker 20 min of emergency light might get you to the pot for business but you'll never find the paper in the dark-right? with emergency lights even taking a month to full charge is reasonable if you get an hour or two of light from it.. there is no real need for quick recharging "in most cases". 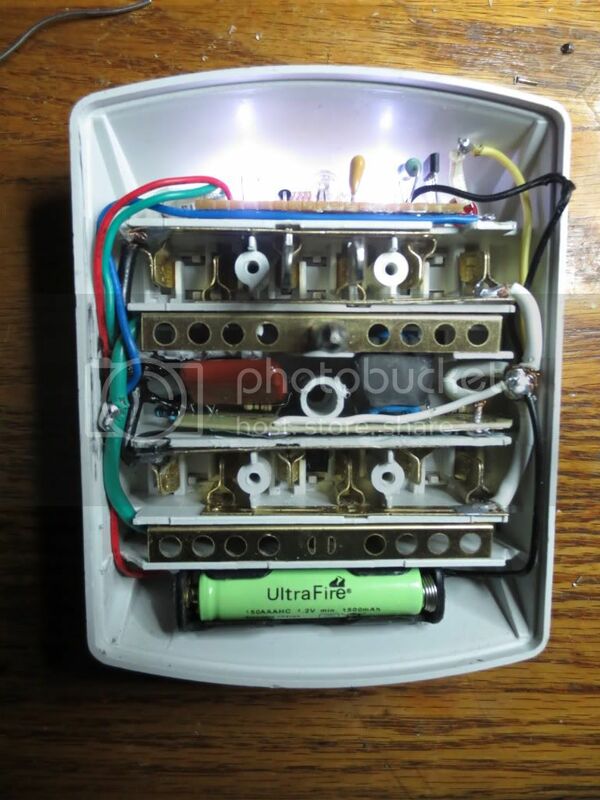 it would be different if it was a battery backup for a heart monitor..
for the most part imo, your still on track and your project looks "commercially acceptable" or as good quality as you get from the store..kuddos! It lasts about 10 or 15 minutes instead of an hour so I blame it on the battery I got. I have a new LED project to share I though I had brought the right thumbdrive to post pictures but didn't anyhow.. I made a (beer-can battery) if you never seen one you missed little but here it goes. to make the required cell you will need (9 clean empty cans),(9*8inch strips of 10-12 gauge copper wire),(some self tapping screws). 1)wiggle/break the open tab off the cans and force the lid part flat open. 2) strip 3/4 inch insulation off a strip of wire make a loop.use this loop as a screw hole and bend the wire in an "L"shape so one end attaches to a can by screw and the other end of the wire reaches through the drink hole in the can beside it. strip the end of the wire the reaches into the next can this is an electrode plate. wrap all the cans in newspaper to insulate them from each other. put all 9 wrapped cans in a shoe box and screw in the electrode "wire" . once you have the battery built add 3ounces of vinegar and 7 ounces of water to each cell. your battery should make 4.5vdc. though it will drive a LED directly "kinda-dim",we won't use it for that but to charge another battery. now I suggest a L-ion 3.7-4.2v @ 800-1000 mah rating. from old cellphones. 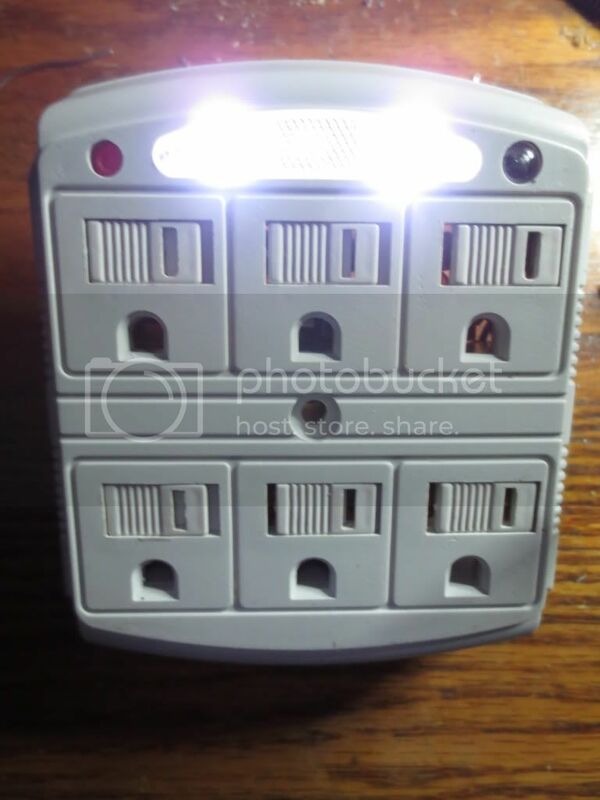 also to complete the project you will need 2- 4.5v solar cells I got mine from broken garden lights. so here is the project idea and concept. a (thermo nuclear aluminum depletion reactor). it depletes aluminum so if you plan to use it long you will want to replace the insulator material with say a plastic cup to catch the (pickle juice) for re-use. I ran this circuit I made for the last month 12hrs a day, still super bright no noticeable depletion of either cans or copper wire but the alum is expected to deplete. in short the solar cell do little to charge the battery so does the can battery but though we get all the sun has to harvest, it continues to charge at night from the can battery. now I am using 3 (9can) cells in parallel at 4.5 volt. now and have all i need to use this light 12 hrs a night and still very bright after a month..
ok so the connection is simple the solar cell connects one leg to the phone battery the other to a cds cell then to the other leg of the battery. this isolates the solar charging circuit. the can battery circuit connects the same way with a rectifier diode in series. this makes sure current only moves one way. "the can battery never needs charging", it charges itself as the aluminum depletes. never charge it as it will deplete copper and create a toxic gas "so just use a diode in series" with anything you power. so you have solar circuit in parallel with the can circuit in parallel with the li-on battery. the l-ion is only a storage tank. 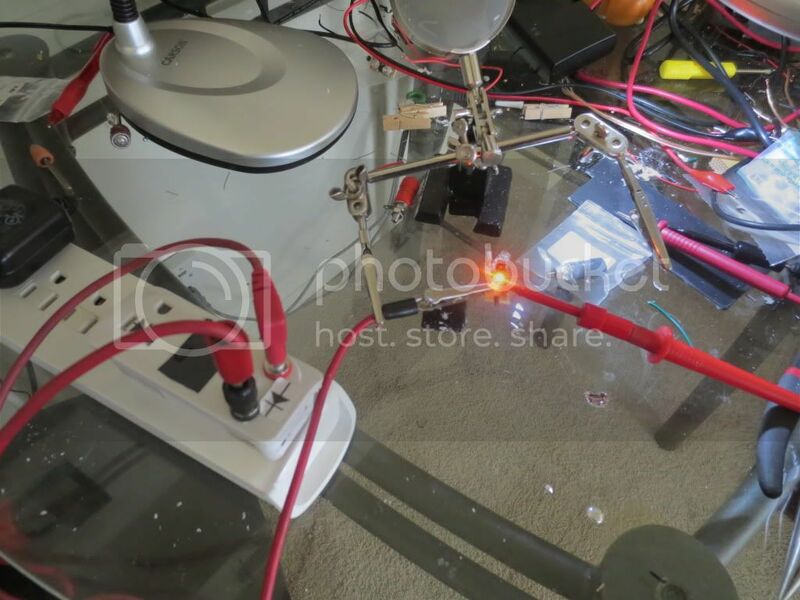 "now you can build a low current LED circuit to be powered with a real nuclear reactor in your home!" imagine that.. It is very sensitive to room lighting too so it saves battery power. Protection is done with 3 small fused MOV's (750 J) next to a night light bulb with photocell sensor. Red LED indicates fuse is not blown. 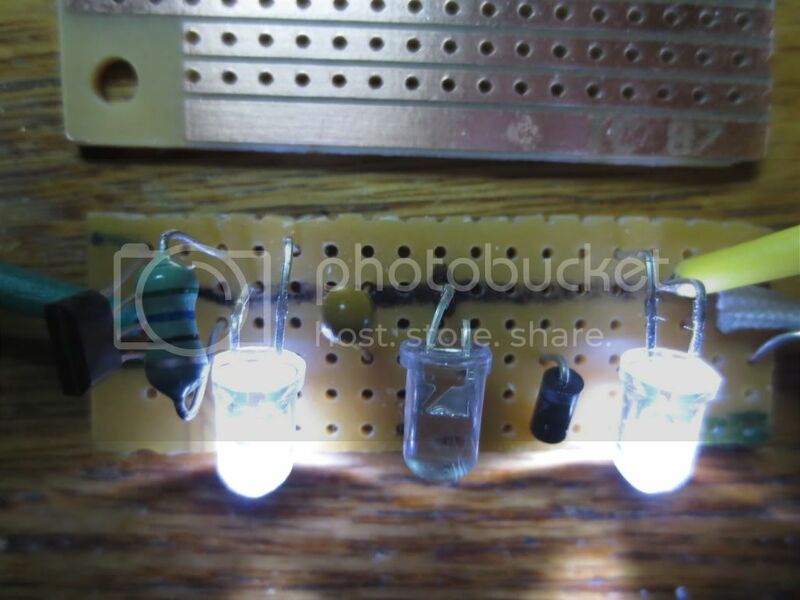 I salvaged the photocell and LED which will still be used in the MOV circuit, just not on the board. I also had to cut off the right side of the PC board a bit, but left the LED resistor and LED anode (+) wiring hole intact. Now the top window is open, waiting for the new 5252F power failure, nite lite circuit. 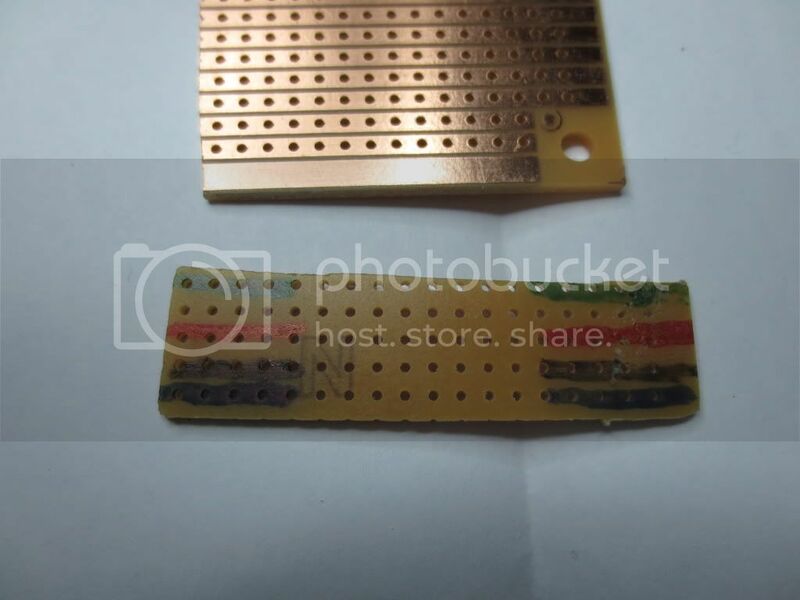 The left side of the old PC board can be used to hold the high voltage capacitor, 30 volt MOV and resettable fuse. 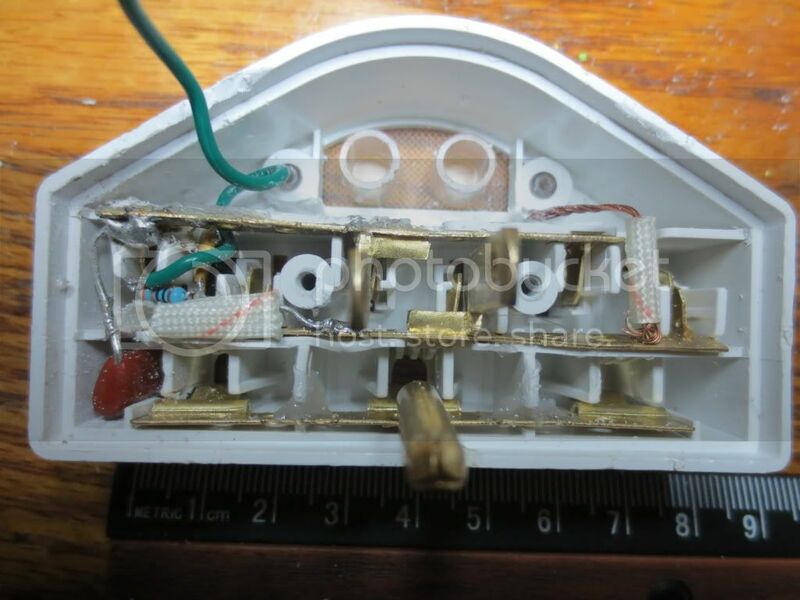 The common white is wired to the black battery wire and the yellow wire goes from the MOV board to the LED. The only extra channel needed was for the small green AC wire to rectifier and green LED supplying 1 volt DC to Pin 1 on the bottom. I had to chip out a bit of plastic for the capacitor I used as it was kinda big. You can get smaller ones rated at 600 volts. The blue wire runs from the large green ground wire to the red protection status LED so that it will not light unless there is a ground. Stanley totally ignored the ground as I have seen other surge suppressors that at least check for a good ground. SHOCKING! I am seriously considering using ground instead of neutral for the AC common so that no ground results in no green light. Another thing nice about this driver chip is that the AC will run the failure lights if the battery is completely dead or disconnected. So if all three LED's come on you know that the rechargeable battery is causing the problem. Contact me if you are interested in purchasing some LED driver chips. Another pathetic orange night light. It actually dims too, but not very well. The light is a small bulb, not an LED. We can't have that! to the plus side of the battery which is + face down. The .068 charging capacitor is on the left ready for the fuse and MOV. red battery wires. I'm using a clear LED diffusion lens holder to hold the photocell off to the left side of the window. The top green row is for the trickle voltage connections of the green LED and anode of the diode to Pin 1. The red row is for plus battery, black is negative battery and blue is for chip output to the LED anodes. 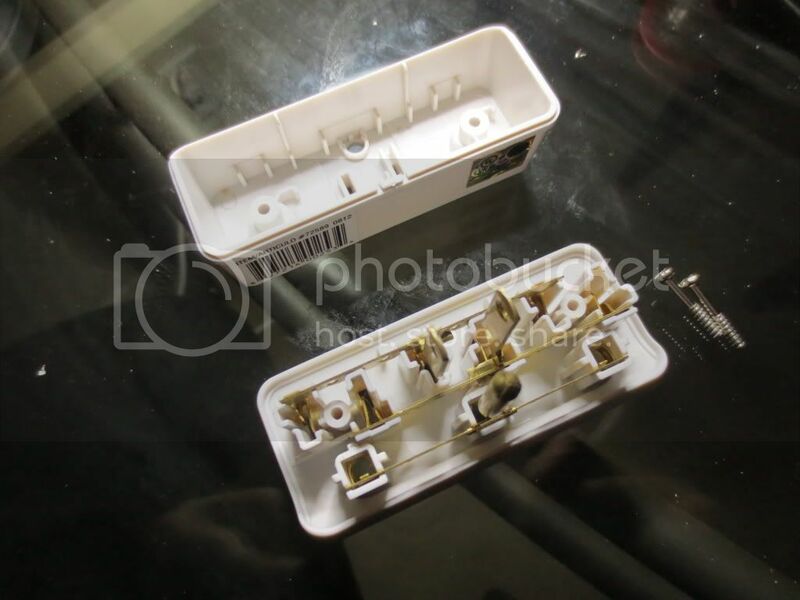 There are 2 mounting openings in the window for the power failure LED's, but the charging LED is on its own. Remember that the charging LED has the long positive anode lead going to common instead of the cathode like the other 2. I used a copper trace board with 5 copper rows. The 5252F chip and coil are mounted on the right end. white wire left over from the old nite lite circuit. The .068 uF capacitor delivers about 1.2 ma for charging and sends 1.40 volts on Pin 1 of the 5252F chip to keep it off. The .1 uF capacitor delivers about 1.9 ma for charging and sends 1.46 volts to Pin 1 of the chip. The power failure LED's may blink if the photocell gets ambient light from the LED's internally or externally. 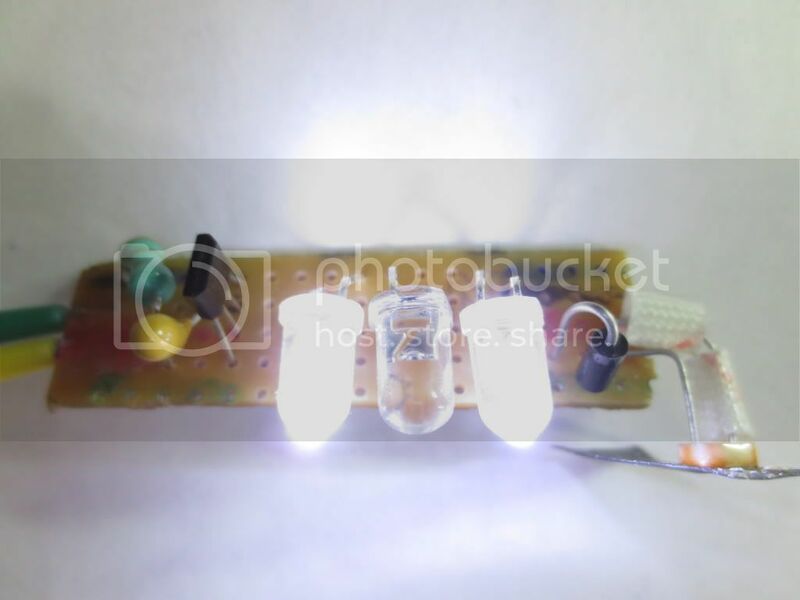 The first time I tested the board, the photocell went into the hole wrong and the LED's blinked pretty fast. 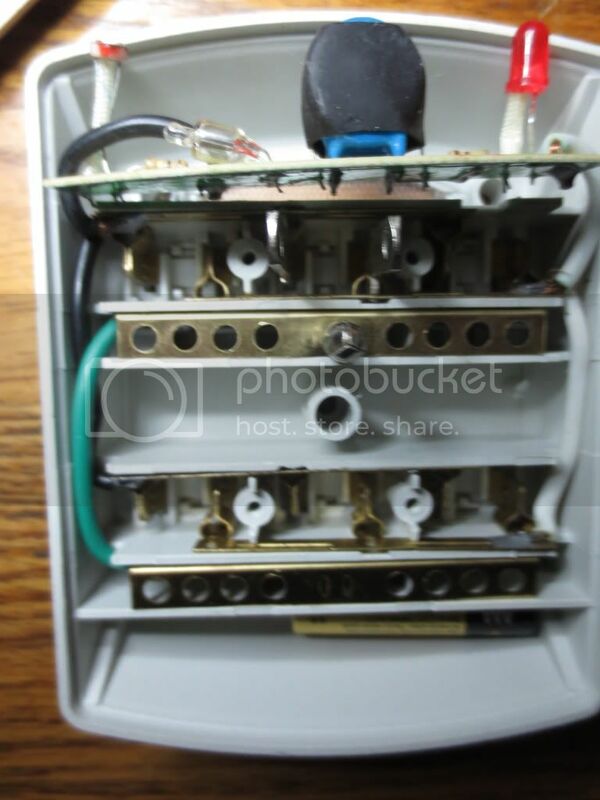 Note: This particular 3 outlet box has part of the AC bus that protrudes up into the center of the circuit board area! I isolated and sealed the circuit area with clear latex calking and allowed it to cure before installing the low voltage board. The red LED tested good with my Joule thief LED tester, but it would only flicker with 120 VAC. I checked the thermal fuse between the MOV's and found continuity from the Line voltage to the LED resistor. 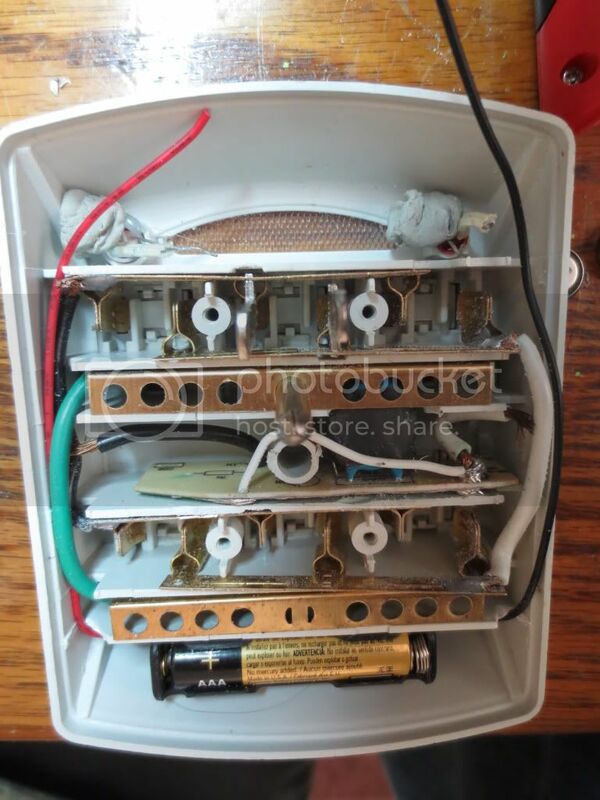 eliminate reverse voltage from the 110 volts AC. That may have contributed to the LED's early demise or it was defective.